Located on Chicago’s iconic Lake Michigan shore, The Field Museum of Natural History, also known as The Field Museum, is one of the largest premier natural history museums in the world. The name honors Marshall Field, the first major benefactor who donated $1 million dollars towards the museum. The museum’s current building opened its doors to the public in 1921. Since then, the collection has grown to nearly 40 million artifacts and specimens, and attracts up to two million visitors annually. In 1921 the site area of the museum was constructed using poor fill material, and rubble from the Great Chicago Fire of 1871. The building had been built with structural columns, and the ground floor was of concrete foundation slabs placed on sub grade soils. As a result of this construction, the poor quality of the soil and it’s low bearing strength was causing the structure to subside. The ground floor of the museum, known as the Pacific Research Room had settled 2/3 inch across various areas of the floor. The 6075 ft2 room needed a specialty repair solution that would stabilize the structure, prevent future subsidence, and work with some structural challenges the building had. 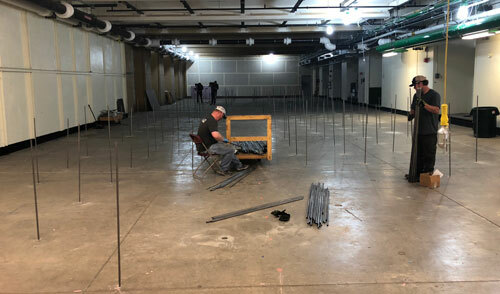 Those challenges included utility lines that run the length of the area, and crawl spaces under certain concrete slabs with ground water present due to the building’s proximity to Lake Michigan. The museum enlisted the help of a construction-consulting firm for the building’s repair. Dynamic Cone Penetrometer tests were conducted during the planning phase, to confirm the areas of the floor that had the most severe soils. The museum’s team determined that a fast, precise, and low-disruption repair method was needed to stabilize the structure at it’s ground level. URETEK was chosen to stabilize the building due to our history of success in expanding polymer resin injection solutions, also known as “polyurethane grouting” and/or “polyurethane foam jacking”. The museum’s repair plan would utilize URETEK’s Deep Injection® Process to effectively fill the subterranean voids, and compact/densify existing underlying supporting soils to the point of refusal. 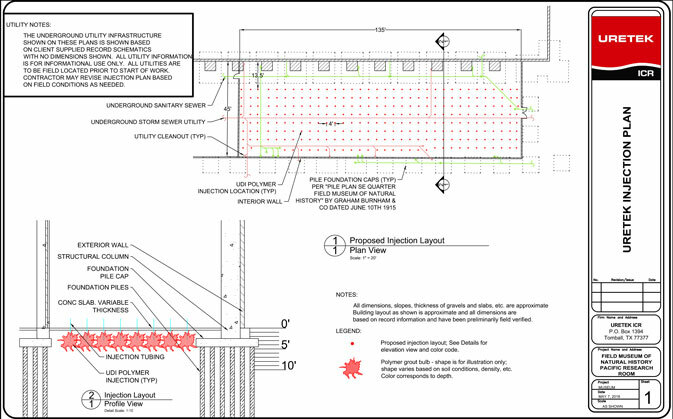 URETEK’s repair process would involve injecting structural grade polymer through 5/8” (penny-size) holes drilled through the concrete slab in a 4’ x 4’ grid pattern. The injections would span across the entire area to stabilize the floor and prevent future soil settlement. URETEK’s technicians effectively applied The Deep Injection® Process across the 6075 ft2 Pacific Research Room. The process effectively and quickly consolidated the weak soil, filled voids, and increased the bearing capacity of the concrete slabs. Exceptional control over the polymer injection process was demonstrated by the technicians- a critical component in restoring older buildings with underground utility lines. The ground floor of the museum was successfully repaired and stabilized in only three days time, with zero interruption to the museum’s daily operations. Thousands of dollars were saved in time and money by utilizing URETEK’s soil stabilization and foundation repair solutions over other repair methods. 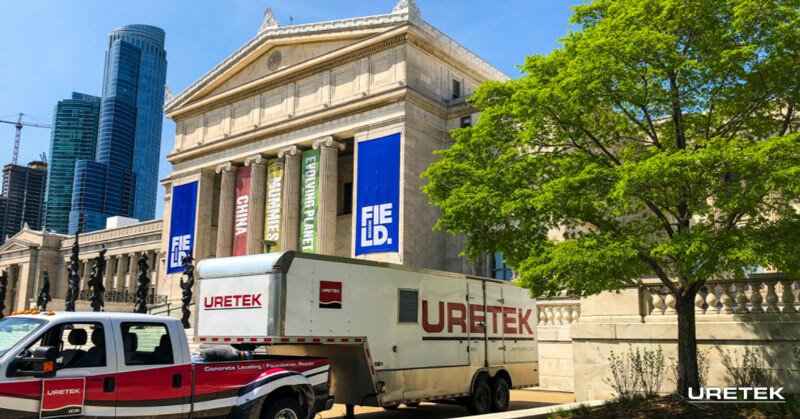 URETEK is honored to have been able to help The Field Museum of Chicago by restoring strength and stability to their beautiful and historic building.